The Young Toddler Environment. Building Relationships and Purposeful Exploration. The environment provided is safe and loving, with consistent and predictable schedules and routines. Practice in separation occurs with intentional and kind support. Language is expanded by using descriptive words; emotions and feelings are described and empathy is encouraged. Toys fostering pretend play, cause and effect and movement are offered. Engineering play begins. For registration information for Young Toddlers please click here. To see the class offerings and tuition please click here. If you are a parent of an enrolled Young Toddler you may access the Parent Portal here. SOCIAL EMOTIONAL: Positive and responsive relationships are key to social development and academic success. Expressing and beginning to regulate emotions and feelings are critical in building self confidence and independence. A young toddler’s social emotional development also involves learning how to understand others’ feelings. PLAY: Child-directed play in a safe environment and with positive adult responsiveness provides the building blocks for brain development. Parallel play is the norm. Symbolic or pretend play is an appropriate way to experience feelings and emotions of others; children begin to understand the impact their actions have on others. Make believe play provides a forum for children to think symbolically and allows them to work out things for themselves. MOTOR: Large motor play such as running, jumping, reaching, lifting, carrying, and balancing promote children’s health and muscle development. Gross motor play is directly linked to brain development and social emotional growth. 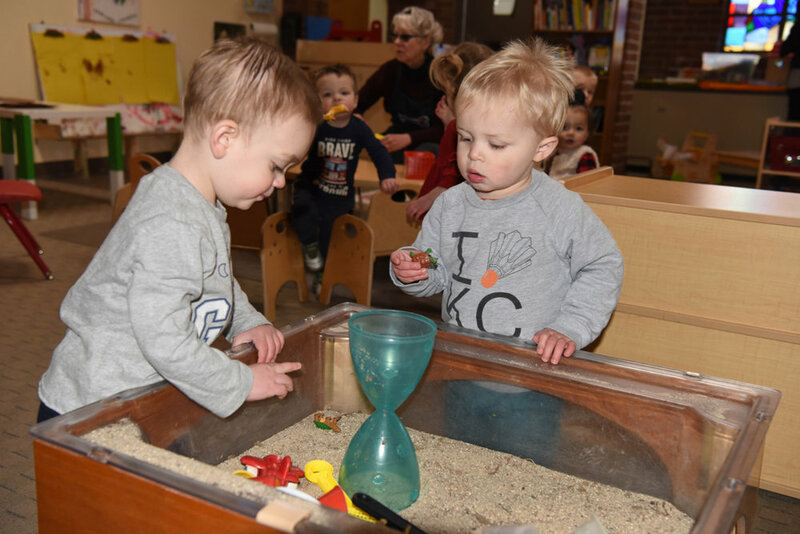 Children use their senses to explore their environment and then begin to actively explore and manipulate objects, building fine motor skills. LANGUAGE AND LITERACY: Young toddlers use descriptive commenting from adults to better understand the world around them. 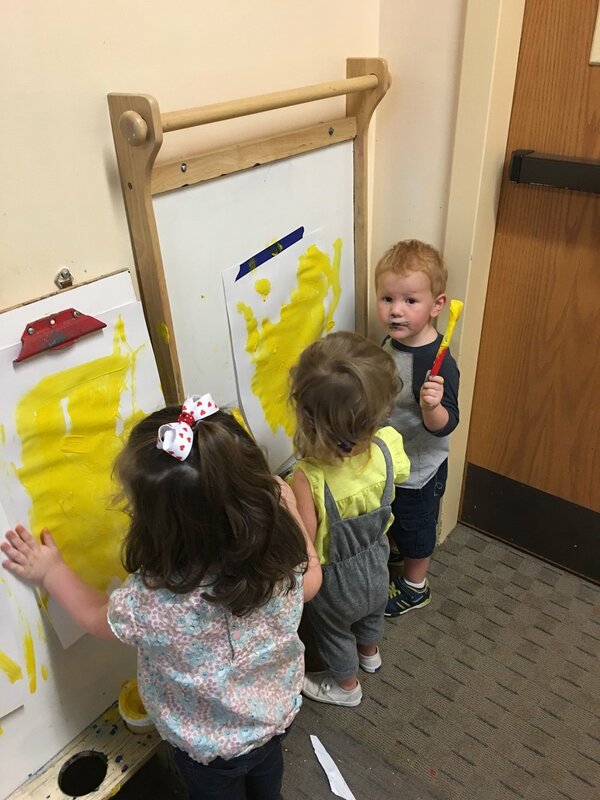 Comments regarding the adult’s actions or the child’s activities increase a toddler’s awareness of what he is seeing, hearing, doing, feeling or experiencing. Children understand and follow one-step directions. Descriptive words are important for language expansion. Books are critical to children’s language development. COGNITIVE: With basic language in place, naming items and descriptions build on a child’s knowledge of the properties of the objects they explore. Problem solving results from interactions with materials and people. Curiosity promotes exploration which in turn stimulates cognitive growth.